Roohul Amin Rohullah A min Ameen was born in Dasht e Archi District, Kunduz Province. Another source said he is from Kunar, and allegedly his birthplace is Bajaur, Pakistan. The fact that an outsider could govern over Farah province for four years and without serious challenges was possible thanks to the political support of Afghan Millat at both the local and Kabul levels, and some degree of power-sharing with other locally influential political groups. Amin told Killid: "I don't have an official relationship with the Afghan Millat Party(of which Jelani Popal, the Director of IDLG is a member) , but I was appointed as governor by Mr. Popal, so all think that I hold membership of Afghan Millat Party." Abdul Malik Sediqi, the financial and administrative IDLG deputy says Amin was the candidate of IDLG for the post. He earlier worked with several NGOs. Amin enjoyed a full four-year term in Farah, making its administration one of the most stable in the country. 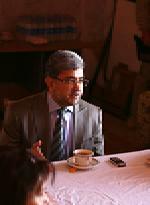 His replacement by former Paktika governor Akram Khpalwak,was officially announced at the beginning of April 2012.